Complete with parts, battery, PC board and instructions. The light sensor allows the jitterbug to come alive and scoot around with the help of a tiny vibrating motor. Customize its antennas and legs. Flashing LED allows you to find this little critter. Operates on a 3V CR2430 coin battery (included).Size of PC board 1.8” X .9”. Complete with parts, battery, PC board and instructions. Soldering required. Skill Level 1. One of the most reasonably priced robots available anywhere! How do I order the Little Jitterbug Robot Kit? 2. Or you can call us at (800) 321-2155 and ask for product 02-756. The Robot Builder's Bonanza includes everything you need to know about starting to build robots. 99 amazing projects. 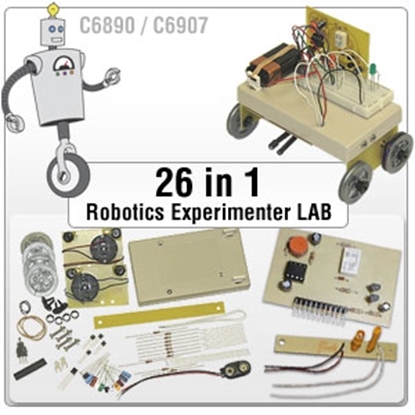 Hands-on labs with 20 robot projects and 6 instructional exercises. Building robot drive trains. Learn everything you need to build your own robot drive train.